Fusion Woven Fabric Repositionable with Split Back Liner makes a great alternative for those that are currently using vinyl paper to create wall graphics, signage and even bumper stickers. Unlike vinyl paper, our durable product won’t stretch when removed from walls and will keep its shape through countless reapplications. The face stock is made from woven polyester fabric, resulting in a water, UV and tear resistant paper. These qualities make this removable sticker paper perfect for indoor and outdoor paper applications alike. 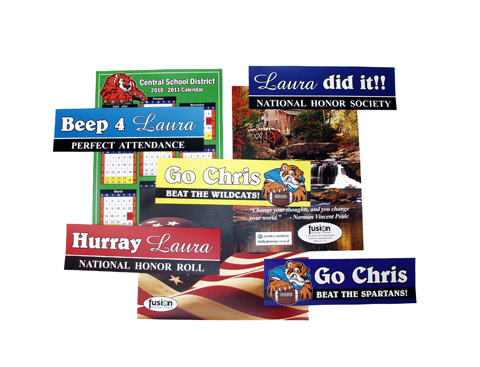 Unlike vinyl decal paper products, this product is truly engineered for high heat toner digital printing. Expect the finest in image fidelity, color brilliance, and repositionable qualities that are superior to magnetic paper options. Fusion Woven Fabric with Split Back Liner adheres to many approved surfaces, such as painted walls, wood cabinets, glass, metal and laptops. This alone gives it a leg up on magnets, which are limited to metal surfaces. Add in the fact that this durable polyester fabric product is also repositionable and now you’re onto something! You will find that our repositionable product is superior to removable paper because it can be moved over and over again. Who does our Fusion Woven Fabric Repositionable with Split Back Liner benefit most? It benefits customers looking for not only an alternative to magnets but also one with an easy to bend and peel release liner. This product’s release liner has four scores (every 2.4″) running parallel to the 18″ direction. No matter what size you guillotine cut or die cut the sheet to, there is a good chance you will have a score on the liner on the back. Please note the release liner on this product is not optimized for digital printing. The functionality of magnets is confined to metal, primarily refrigerators, and as refrigerators move toward stainless steel the benefits of magnets continue to erode, because magnets don’t stick to stainless steel. 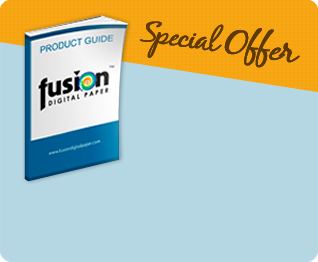 Fusion Digital Paper is proud to offer the perfect alternative to magnets, because with Fusion Woven Fabric Repositionable with Split Back Liner, your customer can put your marketing materials just about anywhere. Fusion Woven Fabric Repositionable with Split Back Liner is made for high heat toner production digital equipment.